If you’re looking for an engaging and inviting, warm and welcoming, but easy to setup and use and feature-packed modern feminine WordPress theme, look no further. 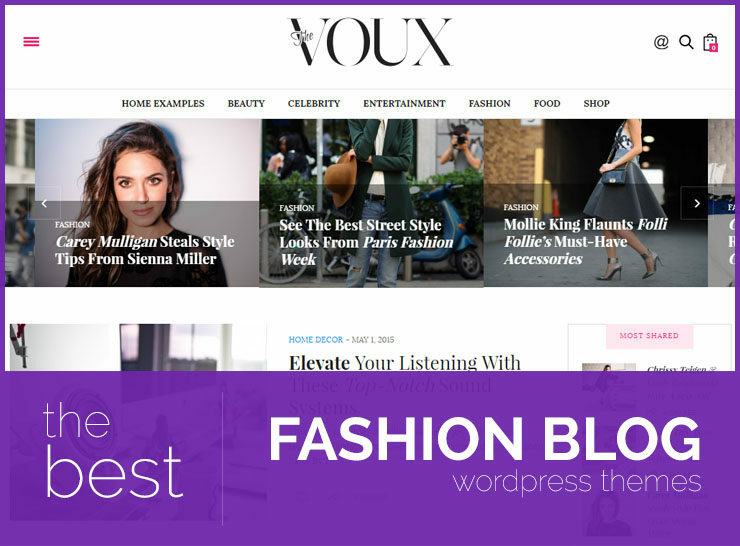 These are some of the best feminine WordPress themes that are suitable for food blogs, fashion blogs, life style blogs, personal websites, small business websites, and online shops looking for an elegant delicate touch. Some of the most successful blogs on the Internet today are being run by women. From food blogs to lifestyle and fashion blogs, mommy blogs and DIY organization tips and tricks, women bloggers are leaving their mark on the web by creating original, quality content accompanied with great photos. In order to house their content, they mostly need beautiful feminine WordPress themes that give off a friendly, girly, and delicate vibe. Some of these feminine themes are WooCommerce ready so you can also use them to sell your goods and services online. Most of them offer some kind of support after purchase and some even offer an affordable service for installing and initially setting up the theme for you. You can’t go wrong with such a large comprehensive list of feminine themes. The following is a list compiled from multiple sources – each link opens in a new window so you can go through each one by one and decide which theme works best for your needs. Best of luck! All these feminine themes require a self-hosted WordPress site. For that perfect blog that is beautiful and restrained Juliet Pro exhibits your feminine side with its sophisticated features and design. Juliet Pro is perfect for a lifestyle themed blog which include fashion, food and wellness. Its pretty and modern design exhibits contents in a pleasing style. Packed with powerful features Juliet Pro makes it easy for you to put up your website easily. Essential features include built-in ads, LookBook/index template and multiple slider options. Juliet Pro’s aesthetics is sure to charm customers. Images and text are displayed in a color scheme you can choose from prepared by our leading designers. Involve your audience with a blog that shows your elegant and pretty style with Juliet Pro. 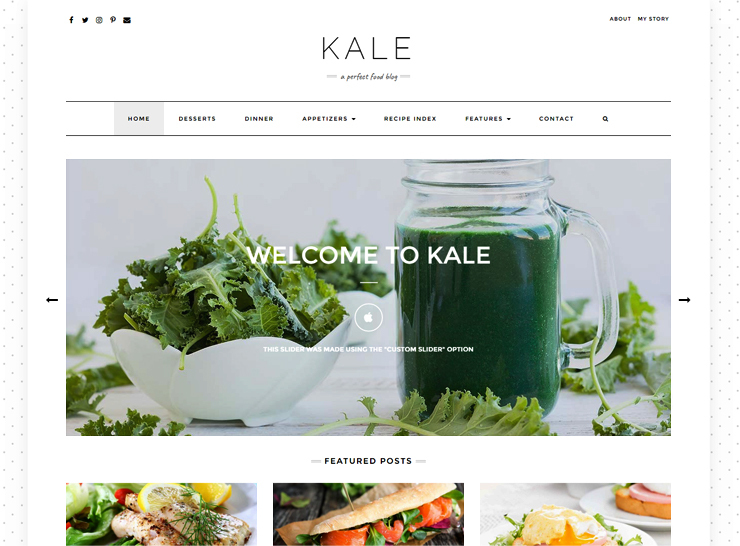 Like its namesake Kale, the theme Kale Pro evokes something crisp, fresh and succulent. This is translated to a sophisticated design with Kale Pro’s charming borders and color themes. 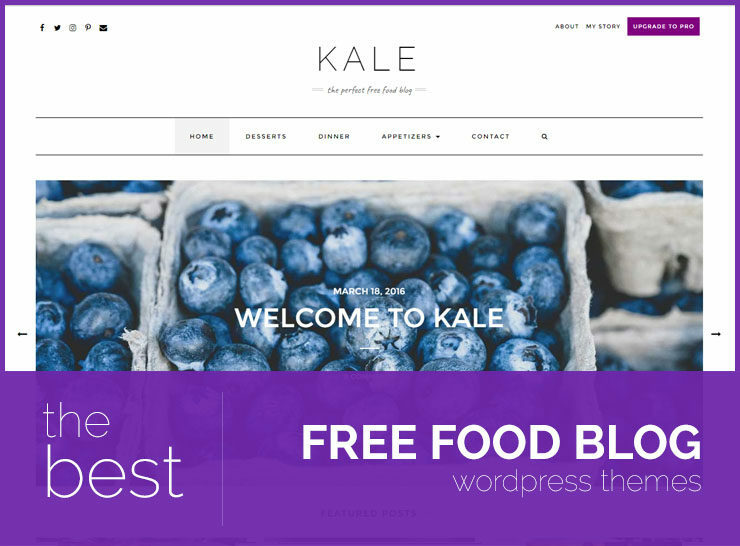 As the name suggests, this theme is the excellent choice for your food blog it is also suited for a lifestyle blog. Create compelling images and lay them out in a neat and organized streamlined fashion. 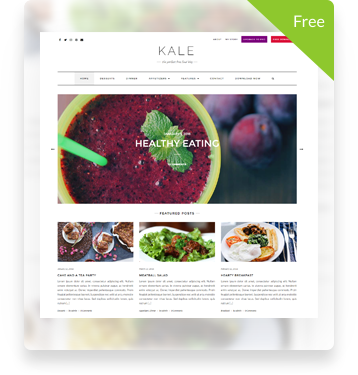 User friendly and easy on the eye, Kale Pro is lightweight but packed with powerful features. Kale Pro is easy to setup and migrate to. Essential features include recipe short code builder, special category template and front page featured posts. Captivate your audience; create a website that is a visual feast with Kale Pro. With more than just colors and design in mind the Tickled Pink creators think of your ideals. Beauty and happy moments are meant to be shared. Share your style on the internet with pink pastel colors or an array of customizable layouts and themes to suit your design objectives. Make your audience equally tickled pink with charming photos laid out on a background of minimalist bars and charming fonts. Features include stock images to enhance the visual theme of your website. Change colors with WordPress Customizer and upload your own customized background. Thinking of setting up shop? Tickled pink is WooCommerce ready. Tickled pink also features Html5 markup and is mobile responsive. Enthrall your audience with more than just stunning visuals, share good vibes and happy feelings. Make them tickled pink. Olsen is a beautiful theme, specifically crafted for blogging and perfect for lifestyle and fashion bloggers. It is minimalistic yet elegant, and exudes a lot of class and character, all the while providing an optimum and smooth reading experience for your visitors. 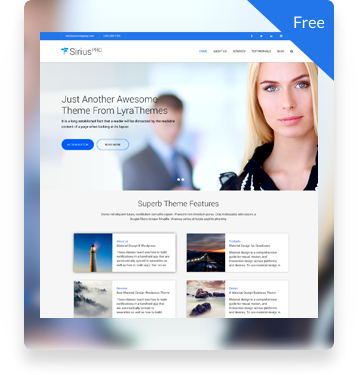 With several layout options for posts and pages, and column layouts – this theme can be used to create a truly unique look. Olsen comes with infinite style variations with over 20 color and typography settings that can be used to customize the website to match your style and brand. With a plethora of Customizer options, you can build an extraordinarily stunning but aesthetically clean and provocative website. Olsen includes Lookbook templates which are a must have for any fashion or style blog. Show what’s in your closet by utilizing this special template which puts a great emphasis on the images. Olsen is WooCommerce ready – meaning you’ll be good to go with a beautiful store as soon as you decide to start selling online. No rummaging around the Internet looking for another theme that looks good and does allows you to offer your products and services for purchase online! Olsen does it all for you from the start. Backed by powerful support and constant updates, Olsen is a great choice for a feminine WordPress theme such as a lifestyle blog, fashion blog, recipe blog, or just a regular everyday journal. It is minimal yet elegant, conceptually unique, professionally graphically designed and very carefully crafted, providing an unparallaled reading experience for your visitors. The Laurel theme offers something different. It makes your website elegant and fresh looking. With its tools for customization and built in themes, Laurel creates a heady visual experience that captures and engages. Thinking of setting up lifestyle blog or a shopping website? Laurel helps you with your goals with its fast and powerful design. Essential features include a 100 percent responsive design and WooCommerce and e-commerce plug-in perfect for web shop owners. Make a neat showcase of posts on any page using Laurel’s Category Index Shortcode. Customers will find this website easy to navigate and user friendly. Show them what you have to offer with 5 blog layouts that exhibits your content in compelling ways. Redwood is an amazingly beautiful, aesthetically vibrant, and technically accomplished theme that has over 4000 downloads. It is especially crafted keeping bloggers in mind and with the mind boggling customization options available, it can be tweaked and molded into any look and feel desirable. It boasts a stunning slider and promo boxes to highlight your special content and offers. Redwood enables you to stand out from the crowd with its sophisticated and modern design and plethora of features that enable you to craft a unique experience for your readers. 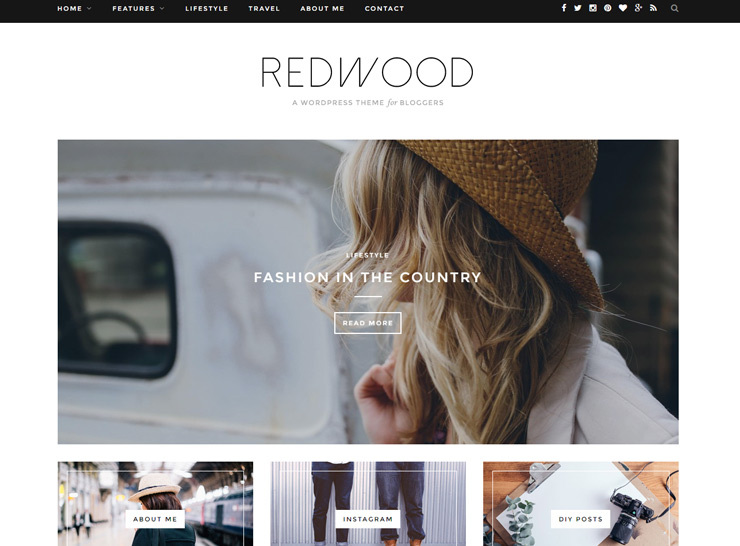 Choosing Redwood for your blog is a no brainer, with its gorgeous and pristine design and carefully crafted well thought out layout, along with a full chest of features and special options. If you’re looking for a great looking theme that also doubles as a magazine theme, this is it. 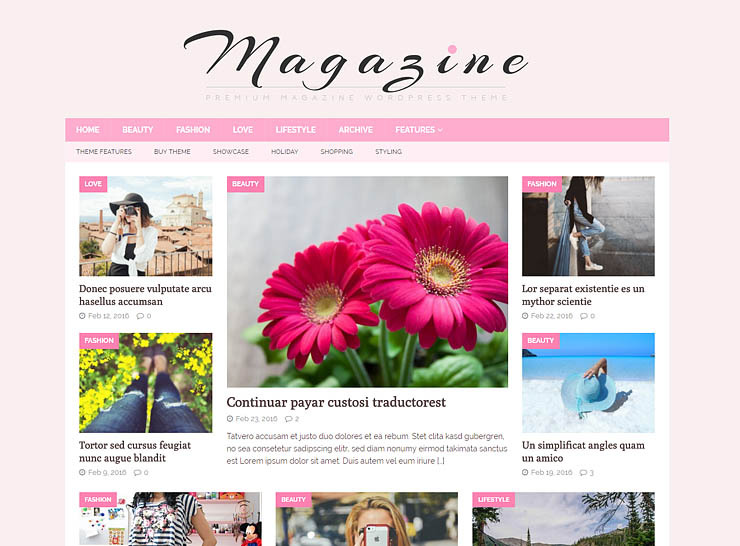 This modern yet charming feminine magazine theme is one of the skins for the popular MH Magazine theme. 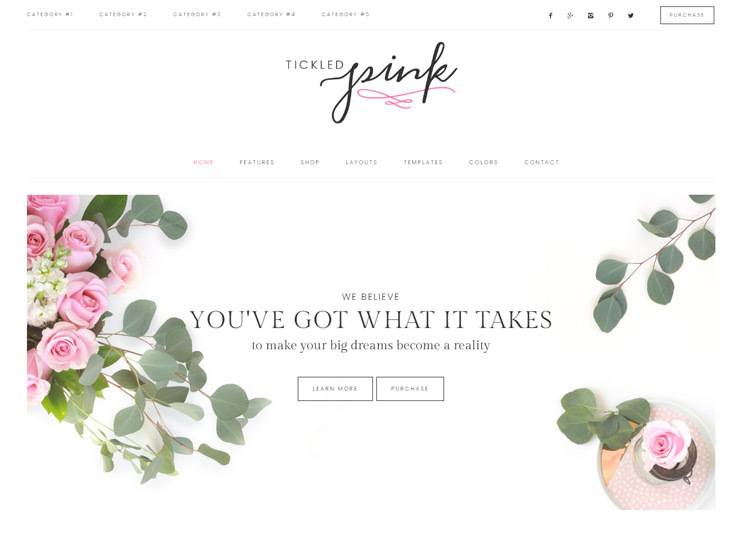 Suitable for creating neat and stylish editorial websites, the theme comes packed with features enabling you set up a professional, modern and appealing feminine magazine website in no time. Pick your own color to match your brand, set up your own background color or image, and set your own logo with the convenient controls built into the theme. The theme looks great on devices of all sizes and content presents itself in a well-organized and engaging manner whether on a small or large screen. 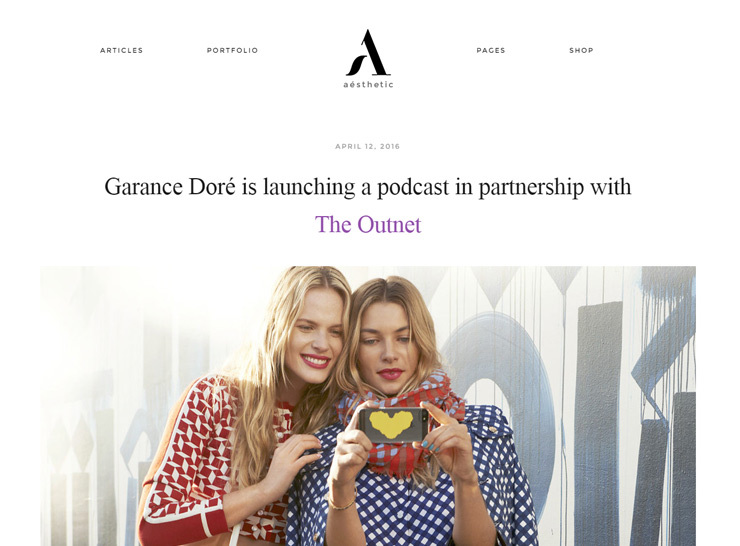 It is the perfect solution for fashion and lifestyle bloggers, or journalists and editors looking to set up an effective online magazine that caters to a wide range of audience, while monetizing their website using the built-in banner ad functionality. Key features of MH Magazine are: Unlimited colors, built-in banner ad placement widgets, boxed and wide layouts, widgetized front page, multiple page templates and sidebars. Aesthetic is a strong, feature-packed, extremely clean and minimalistic, easy to use, flexible and modern responsive feminine WordPress theme perfect for bloggers. The theme is stylish and trendy, with amazing animation effects and a very bold approach to presenting content and images which is sure to keep users engaged and interested in content. The “About Us” page has a special template that can double as a static page and help you create a completely unique home page where you can showcase your team, testimonials and some text about yourself hence enabling you to create a small company website as well using the same theme. 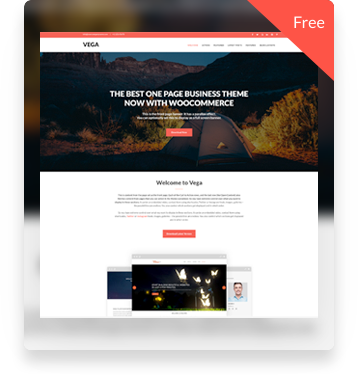 The theme is compatible with WooCommerce hence it is ready to start supporting your online business from the get go. With a special portfolio page, you can showcase your special services or projects with ease. This technologically sophisticated and aesthetically accomplished theme has all the right features to help you blog and sell, showcase products and services, all the while exuding grace, class, elegance, and character. The theme is highly customizable with the ability to change the highlight colors with a single click. Multiple pre-built templates enable to you to create unique pages and the drag and drop builder can help you create many more looks specific to your needs and branding. The demo content can be installed in one click hence giving you a starting point for beginning your new website. If you are looking for reliability coupled with great support and amazing features in a minimalistic blogging or feminine, girly WordPress theme, this theme will be perfect. Main features of Aesthetic are: custom colors, article listing styles and otpions, auto install demo content, WooCommerce ready, multiple built-in page layouts, visual drag and drop builder, Google fonts. 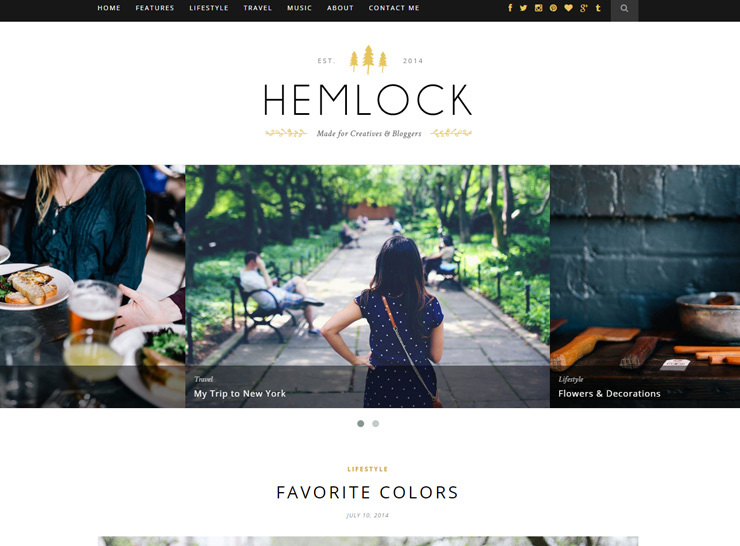 WordPress theme Hemlock is best suited for endeavors that require a clean and streamlined look. Designers of this theme have carefully studied what works to convey a theme of utmost sophistication and clean aesthetic. The result: they trimmed away peripheral elements and devised a sleek one-column theme ideal for creative bloggers of all sorts. Essential features include a responsive design, classic full width blog layout and widgets. With its streamlined aesthetic customers will be engaged to pay attention at the compelling content. You can customize further in line with your design goals using colors via the Customizer. With its artful simplicity, hemlock conveys your content with a look that is light and easy on the eye. 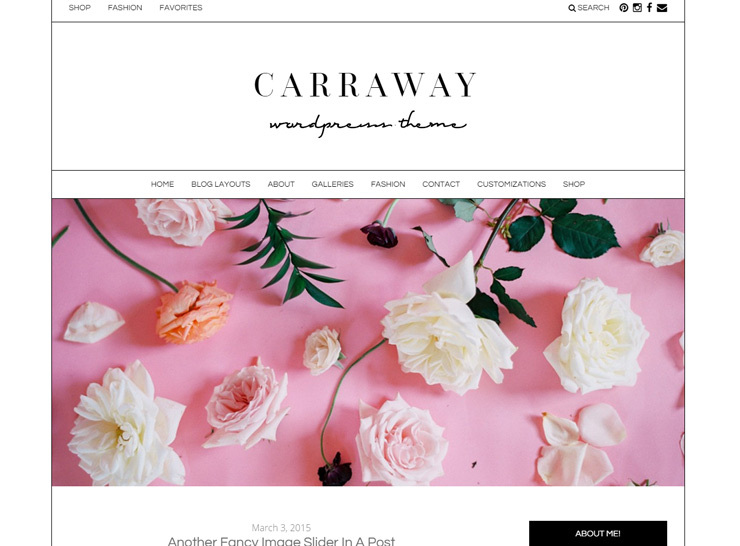 Carraway is the go to WordPress theme if you’re looking for elegance and a stylishly fashionable look. The theme is simple to use and set up and offers many customization options. There are many blog layouts including grid, grid and full post, large image with excerpt, and blog thumbnail with excerpt; giving you control over how you want to display your posts depending on the kind of content you’re sharing and writing. There is social media integration where you can display your Instagram feed, and Pinterest pins and display your social media icons in multiple places. WooCommerce integration makes this the ideal theme for blogging and selling. The customizable color scheme means you can change the colors to match your branding. All in all Carraway is a modern blogging template with tons of blog options for bloggers wanting a site that’s both simple and flexible and gives you great opportunity to show off your images and content. Main features of Carraway are: multiple blog layouts, color customization, social media integration, clean design, premium support, WooCommerce integration. Bold, awesome and compelling; blow up your images and make fierce content. These eye catching devices can only happen with Kloe theme. Glamorous spreads, slick pages, Kloe is especially designed for fashion and lifestyle content. No other theme makes bold and beautiful statements like Kloe. With page after page of riveting layouts captivate your audience with your content, products and services. Showcase your style with portfolio layouts that are fully customizable. Thinking of setting up a shop? 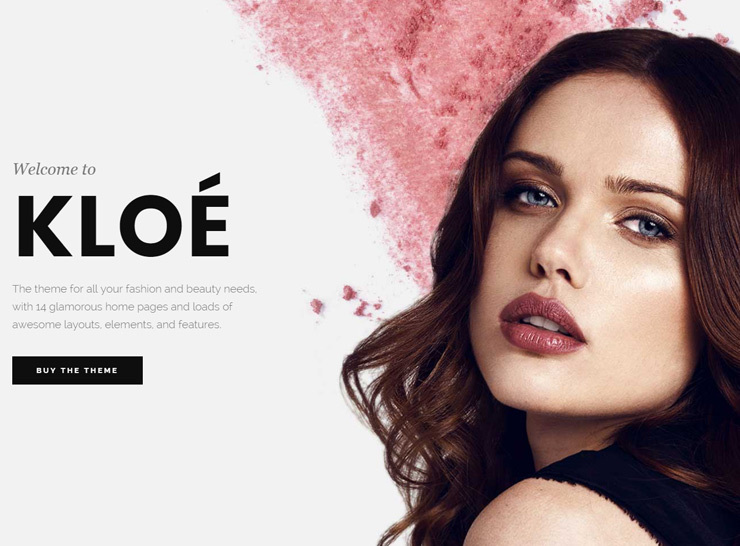 Kloe is fully compatible with WooCommerce plug-in and stylized shop layouts. Kloe understands what it means to make a high impact website. With the sensory driven digital world, you can make your site stand out, with Kloe.